Downtown Holland is always the fun place to be, but it is especially wonderful in the summer with the beautiful flowers, Street Performers on Thursday nights, sidewalk cafe's and more. We stay open a little later (until 7pm) on Thursday and Friday night. Here are two of our friends who graciously agreed to model some new styles for us. 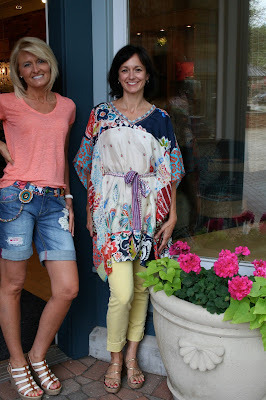 Debbie's jean shorts from Desigual are so cute and Jackie's silk poncho is light breezy for a hot summer night. Of course, you can always see many more photos by joining us on Facebook. Click here to see our Page and please Like us.